This birthplace of grindstones gives birth no more. A few millstones remain here at Stanage Edge, evidence of the stonecutters’ craft. They are evidence as well of the impermanence of technology. They make me look at my computer and smart phone not as modern and clever devices but as clunky things on the threshold of history, soon obsolete junk. Why was I so eager to possess them? What made them so enticing? So cutting edge? What does impress me is that words written thousands of years ago still make sense today. The parable of the Good Samaritan still rings true. Amazing! Twenty centuries have not made it obsolete. 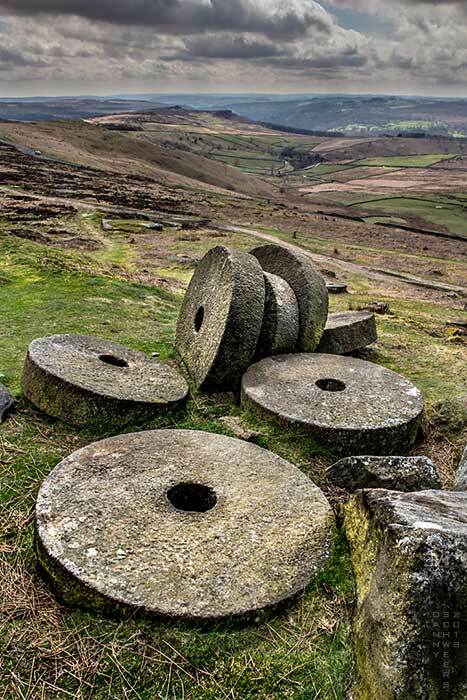 Photo of 18th-century grindstones abandoned where they were carved on Stanage Edge, Peak District National Park, England. This is such a powerful image. I love how the picture stretches on and on with the landscape. Great!! I bet those stones would still work if hooked up properly. In couple of hundred years I bet our phones and computers won’t. Nice thought and image. Thanks. Grindstones are literally on the cutting edge! To your greater point: whenever I get discouraged by the challenges of the church, I am buoyed by the simple fact that thousands of years later, God is still very much alive and desiring to be with us.